Barriers between the gameplay and the narrative are old-fashioned, says Thomas Grip. 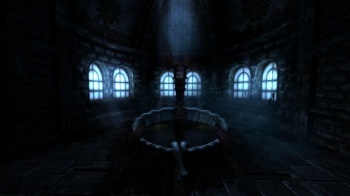 If you've played Amnesia: The Dark Descent, then you know that it is not a game overburdened by cutscenes. Much of the game's horror comes from keeping the player firmly rooted in the action as much as possible, and Thomas Grip, the CEO of Amnesia's developer Frictional Games, wants you to know that was no accident. From Grip's point of view, storytelling in games, for the most part, hasn't advanced that much over the last 20 years, and he believes that a stronger marriage of gameplay and narrative could be the best way to bring the medium forward. "Story is not just the plot," says Grip. "We want the player to play through the story, not just sit through it." Using Another World and Uncharted as examples, Grip compares today's games to those of yesteryear. While over a decade and a half separates the two temporally, their story mechanics are almost identical - run, jump, shoot, then sit back and watch. In contrast, Grip discusses his own games, citing minimalist stories, consistent design decisions, and abstention from "herding" players into exposition dumps or non-interactive cutscenes. "Don't try to beat the game, try to live the game," he advises. While cutscenes have their place and aren't going away anytime soon, it's important to remember that part of the rationale behind cutscenes was often to depict characters in a way that the game engines of yore were not sophisticated enough to support. Whether Grip's next game, Amnesia: A Machine for Pigs will live up to these lofty ideals has yet to be seen, but it's a safe bet that it will hew closer to Amnesia: The Dark Descent than Uncharted.